November 14 2018 – Esteemed World Youth Alliance Africa Advisory Board Chairman, Mr. Oscar Beauttah SS, opened the 9th Africa Emerging Leaders Conference with a strong statement; ‘I long for a time when Africa will be united by one language’. He challenged the delegates to forge ahead with hope and embrace Pan-Africanism. His charge set the tone for the whole conference as the delegates looked forward to understanding better the concept of Human dignity and Bioethics in regard to the African Youth. In partnership with the Strathmore Law School (SLS), World Youth Alliance Africa have been able to host the Africa Emerging Leaders Conference with ease and hence Dr. Luis Franceschi, the Dean, SLS gave the welcoming remarks. Being in the law field, he affirmed the need to make laws that are sensitive to human dignity. 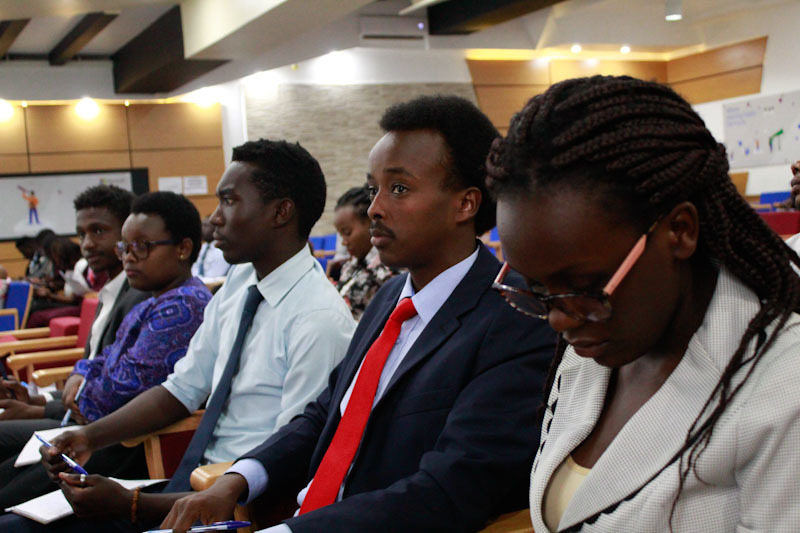 The 3-day conference was themed, “Human Dignity and Bioethics: African Youth Perspectives on Bioethics, Migration and Livelihood Solutions” with each day marked by a thematic topic. On Bioethics – With expertise and experience in Medicine, Genetics, Health Communication, Nutrition and Bio-ethics, the keynote speakers gave comprehensive and factual insights. Dr. Wahome Ngare, OBS/GYN addressed the emerging issues in medical practice. He provoked the attendees to have a four dimensional approach on Human Rights, Responsibilities and Health i.e. Body (Protect Human Dignity), Community Chastity and Stewardship), Soul (Seek life & impart the truth) & Physical Environment (Social justice and sustainable use). Issues of abortion, euthanasia, transgender surgery, IVF and surrogate motherhood were also discussed in depth. The message from all the speakers was all rooted in ensuring that the human person should be at the center of every discussion. WYA Africa Regional Director Patricia Gwambo emphasised the need to understand global threats to human dignity in order to clear the lens in which we view the human person and the world at large. She also introduced FEMM (Fertility Education & Medical Management) as a person-centred approach for women’s health. The first day ended on a high note as delegates chanted the 2018 WYA Declaration on Bioethics and Human Dignity in solidarity and affirmation. On Migration – Ambassador Uriel Norman Garibay of the Philippines Embassy spoke about the migration policies & governance through the eyes of the Philippines. He highlighted key challenges that are faced by both regular and irregular migrants and the remedies that the Philippine government offers. Tim Howe and Lillian Kilwake built on the ambassadors’ approach and narrowed these solutions in perspective of the African Youth highlighting the gaps and opportunities present. Dr. Lubale from the Ministry of Internal Affairs ignited a discussion on the national, regional and international policies on migration where delegates had the chance to continue brainstorming during the breakout session and presented on their findings. 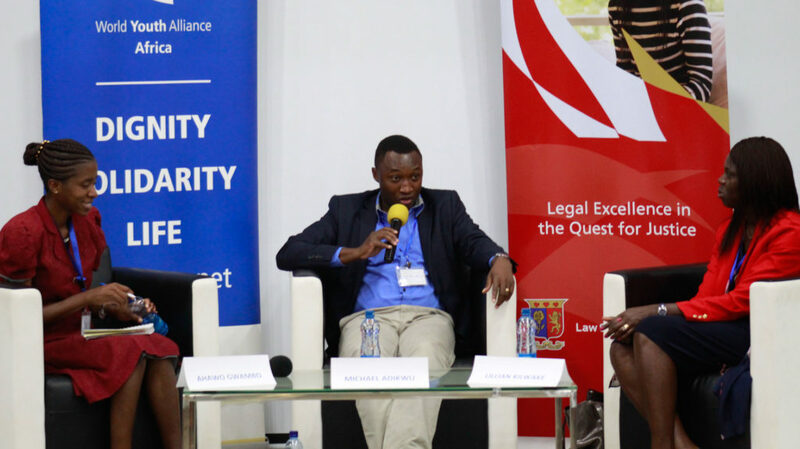 On Livelihood Solutions – Tim Kipchumba, Co-Founder of Questworks gave the foundation of successful entrepreneurship: self-efficacy. Njoki Karwega highlighted the need to understand livelihoods in view of personal development. In the panel discussions, Philip Moturi, Michael Makenzi and Sylvia Tallam ignited a spark over the delegates to consider their future starting now! The key highlight was demystifying the misunderstood money concept of ‘Pay yourself first’. The last day ended with 5 amazing youth sharing their stories in light on their community initiatives and productive businesses. The conference attracted more than 40 young people representing 9 countries and numerous institutions. Most delegates look forward to starting the Certified Training Program as they envision their engagement in opening chapters in their countries. WYA Africa is grateful for her exciting partnerships and networks that continue to aid the planning and execution of the AELC and looks forward to the 10th Africa Emerging Leaders Conference in 2019. 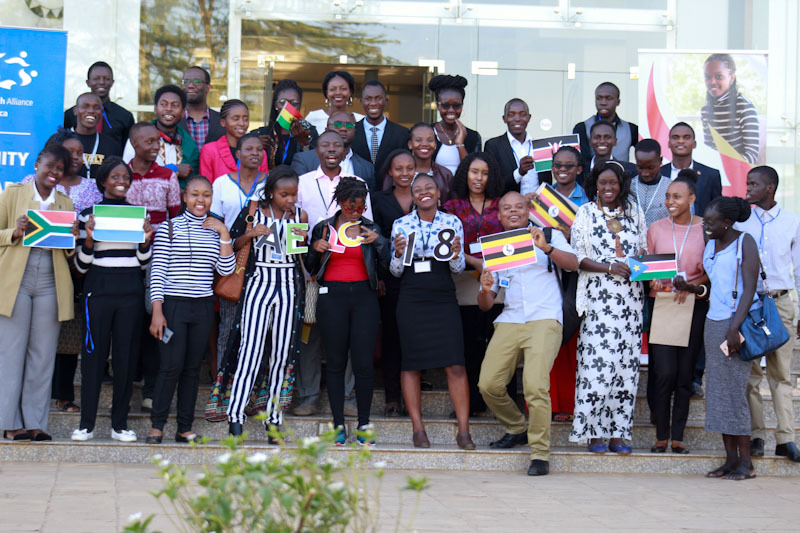 WYA Africa has 5 representatives at the ISF 2018! The 7th Africa Emerging Leaders Conference 2016 just concluded in Nairobi, Kenya.